Trailquest/MBO’s are suitable for all ages and abilities so long as you (a) can competently ride a mountain bike off-road and (b) know the basics of reading an OS map. The map reading and route planning will challenge your mental resolve whilst the hills and dales of the Peak District will undoubtedly test your physical fitness – be mindful however that the fittest/fastest rider is not always the winner! You can enter as solo or in pairs. The event will be held from an undercover venue (Hayfield Scout hut) meaning whatever the weather throws at you post-event you can re-heat and re-hydrate and sit back and chat the ifs and buts with fellow competitors over a cup of tea and a biscuit or two. Event timing is by SPORTident systems. Full colour over-printed OS map sections are provided. Online Entry Closed. For late or on the day entries please email us at info(Replace this parenthesis with the @ sign)darkandwhite.co.uk or text 07970 278085. Within the time allowed (3 hours), visit controls and collect as many points as possible – route planning is as important as fitness. Lateness penalties as per standard BMBO rules. Control sites will be identified by bright coloured tape on an obvious feature to which a SPORTident box will be attached. “Dib” in the SPORTident box at the Start, Finish, all controls visited and the download box at the end. You must use a SPORTident dibber to take part in this event. You may use your own dibber if you have one (please fill in its number on the entry form). If you don’t have your own dibber we will rent you one automatically. Teams please note: both members must carry and use a dibber. A colour 1:50000 OS map (approx size A4), pre-marked with all controls printed on waterproof paper will be provided on the start line. One map per rider is included in the entry fee. Enlarged maps for greater clarity available approx size A3 (£3.00 each). An area master map (without control points marked) can be viewed at registration before starting. Try to arrive at least 30 minutes before your intended start to give time to register/prepare etc. At the start line you will be handed a map and a control value sheet. You will need to present your SI dibber to any marshal on demand during the event. All courses close 2.00pm. Hot drinks, orange juice and biscuits will be available at the finish. For online and postal entries see above and follow the appropriate links. No final event details will be published or sent out. If you wish to have confirmation of a postal entry please enclose an sae with your entry. Event numbers may well be limited – email info(Replace this parenthesis with the @ sign)darkandwhite.co.uk">info(Replace this parenthesis with the @ sign)darkandwhite.co.uk or text 07970 278085 if entering late to check if places are available. Provisional results will be displayed on the day. Results will be posted on the results page after the event. There will be a prize giving at 1.00pm – class winners, runners up will win a combination of prizes courtesy of D&W, Alpkit, Sondor Bikes, and Igloo Cycles. Winter Series League awards will also be presented at the event. NB – classes may be merged for prizes if entries are low. A roadworthy mountain bike, helmet (ANSI or BSI only – not climbing, caving or canoeing types), watch, relevant map, first aid kit, money for phone calls or a mobile phone, suitable clothing for the prevailing weather conditions including quality waterproof is compulsory for this events. Spot checks may be carried out to ensure you comply with these requirements. You should also bring food/drink sufficient for the duration of the event. If you have your own SI card and have pre-entered, just turn up, check the dibber number is correct and sign in. No need to queue! No need to stand about. Get up later! 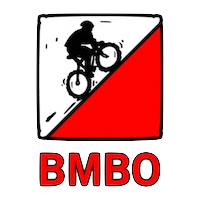 You must be a member of British Mountain Bike Orienteering (BMBO) to take part in this event – it’s quick and easy to register by using the link below.